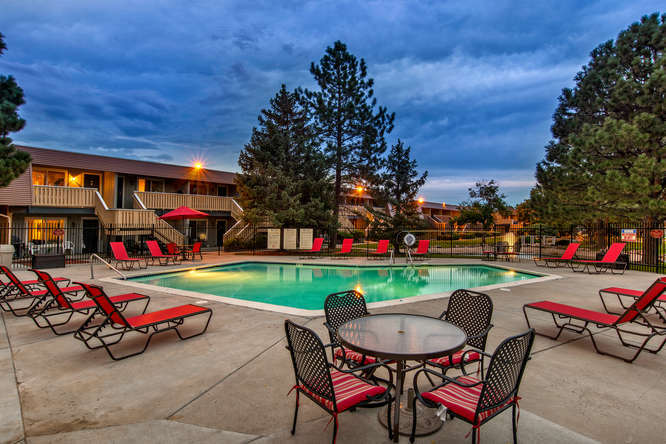 The locally based firm purchased the Landon Park Apartments in Aurora – the latest apartment acquisition by the real estate investment company, which, since the start of 2017, has purchased nearly 800 units in the Denver metro area. It’s a buyer’s market, or at least for BMC Investments it is. BMC paid $58.2 million for the 464-unit community at 100 S. Sable Blvd., located 1 mile from the newly opened Aurora Metro Center light-rail station on the R Line, across the street from the Town Center at Aurora and near the Anschutz Medical Campus and Fitzsimons Life Science District. “We really like Aurora and, specifically, that part of Aurora,” said Matt Joblon, CEO at BMC Investments. “We think there is tremendous upside in Aurora with light rail and all the stations going in, and I think it’s going to be a big catalyst for improvements in the area. “There are a lot of good things going on in Aurora overall,” Joblon continued, also citing projects such as the medical campus and Gaylord Rockies Resort & Convention Center as stimuli for further development in the submarket. BMC Investments plans to make improvements to the community, constructed in 1978. ARA Newmark’s Terrance Hunt, Shane Ozment, Jeff Hawks and Doug Andrews represented seller Bridge Investment Group out of Salt Lake City in the disposition. The seller had updated 35 percent of the units and was achieving premiums of $130 to $200 per month. Additionally, ARA Newmark noted, during the fourth quarter, apartment vacancy rates dipped to 3.7 percent in Landon Park’s submarket, pushing up average rents 10.3 percent year over year to $1.45 per sf. Landon Park features five different one- and two-bedroom floor plans that include private balconies or patios and full kitchens. Apartments average 728 square feet. Community amenities include park like paths, direct access to the High Line Canal trail, water features, two outdoor pools, a fitness center, business center, playground, picnic areas with barbecues, two all-season soccer courts and a two-story clubhouse with theater room and billiards. Holliday Fenoglio Fowler LP secured $46.56 million in financing for the acquisition of the property. The 10-year, 4.4 percent, fixed-rate loan with five years of interest only was funded through Freddie Mac’s CME Program. The securitized loan will be serviced by HFF. The HFF debt placement team representing the borrower was led by Brock Yaffe and Kristian Lichtenfels, associate directors with HFF. BLDG Management, BMC’s property management affiliate, will manage the property. With the purchase, BMC owns more than 3,200 units throughout the metro area with plans to acquire an additional 1,000 units of Class B/C value-add properties in the marketplace this year. It also has several development projects underway, including mixed-use residential, office and hotel totaling close to $500 million. Overall, it owns and manages approximately 5,000 residential units and 200,000 sf of commercial properties.